Motorcycle: "1981 GL 1100 Interstate "
If you do a quick search on the forums about oil you will find a bunch of people's personal experiences with oil. Here are a couple of threads I found that will have some info for you. 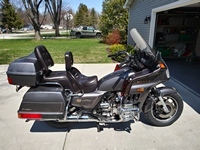 And on this link you can find the manual for you year and model Goldwing that can help you know what oil Honda suggests for your motorcycle and climate differences. 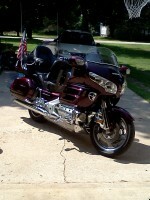 I use Mobil 1 10W40 full synthetic in my 1200. You just want to make extra sure there are no friction modifiers in whatever oil you choose. The label on the oil will indicate if it has them in it. The lower portion on the bottom of the API donut label will be blank.